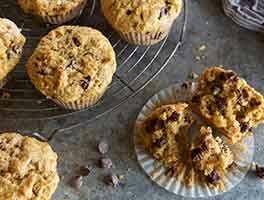 These tender, tasty, fruit-filled muffins — made with self-rising flour — go together in a snap. If you have blueberries in the freezer and our self-rising flour on the shelf, this is a quick and easy option for warm treats on a busy day. Preheat oven to 400°F. 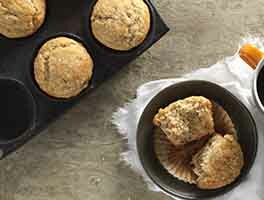 Prepare the muffin pan by greasing the cups or lining them with papers, then spraying the papers with non-stick baking spray; this helps release the muffins from the papers. In a separate bowl, whisk together the milk, oil, eggs, and vanilla. Add to the dry ingredients, stirring until the flour is moistened; it will be a bit lumpy. Quickly and gently stir in the blueberries. Fill the muffin cups 3/4 full; sprinkle muffins with sugar, if you like. Bake the muffins for 20 to 25 minutes, or until they're golden brown and a cake tester or toothpick inserted into the center comes out clean. 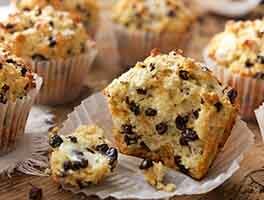 Remove the muffins from the oven, and allow them to cool for 3 to 5 minutes in the pan. Remove them from the pan and serve warm or at room temperature. Wrap airtight and store at room temperature for several days; freeze for longer storage. Don't have self-rising flour? 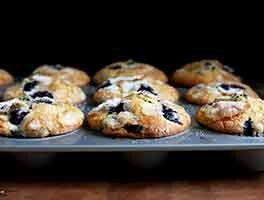 Try our recipe for Blueberry Muffins using all-purpose flour. The perfect muffin recipe! I followed the recipe exactly (using the buttermilk option) and I weighed the flour. The prep was super-easy. The muffin was tender, almost like a cake but not overly sweet. 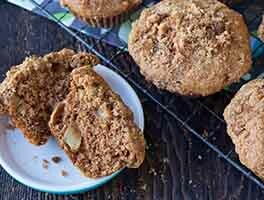 I added some sparkling sugar to the tops which created a nice crunch for the perfect muffin top. Next time, I'll experiment with different fruits. Delicious!!! I made them on the big side so made 9 and baked at 400 for 30 minutes. So easy. Very substantial but a very tender crumb. Oh I also let a tablespoon of vinegar rest in milk because I didn't have buttermilk. This recipe came out great! The whole family loved them. I made them with blueberries first and when I didn't have any I substituted with semi-sweet chocolate chips. That was also yummy! Worst muffins I have had in a long time. Too dry. 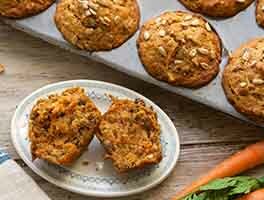 I made mini-muffins with this recipe and they turned out great! I used milk, not buttermilk, and just under a cup and a half of frozen blueberries. Mikayla S. from KAF suggested I check on them after 10 minutes at 400 and that was the perfect bake time, thanks Mikayla! Delicious and easy! Made as written. I do not have a muffin tin, so I used baking cups. My oven runs hot so the first batch baked for 20 minutes, the second was almost 15 minutes. The cinnamon/sugar mixture on top was a yummy addition! Thanks KAF! Great recipe! The only thing I did differently was increase the sugar to approximately 1 cup. So easy and delicious! I've made these 4 times now and they come out perfect and moist every time. Self-rising flour makes them especially quick and easy. The only change I made is to add lemon zest. The batter is thick, but the buttermilk makes the final product nice and moist. My kids love the crunch and sweetness of a sprinkle of natural sugar on top. I'll make these again and again. The amount of milk is way to little for this amount of flour. Up it to 1-1/2 cups of milk and they are perfect.